Buying a house can be costly, but owning your own home is a dream that's hard to ignore—and for the majority of us, the only way to make that dream a reality is to get a mortgage. Yet, with housing prices being what they are, many Canadians find it difficult to save up the needed 20 per cent down payment to avoid paying for mortgage loan insurance. Lenders typically require mortgage loan insurance when a buyer does not have at least 20 per cent saved up for a down payment. The insurance covers the lender (not the homeowner) in case the homeowner defaults on their mortgage. Mortgage loan insurance allows buyers with as little as five per cent down to purchase a home and still get mortgage rates comparable to those with a 20 per cent down payment. The Canada Mortgage and Housing Corporation (CMHC) recently announced that is increasing its mortgage loan insurance premiums. The new mortgage loan insurance premiums will come into effect on March 17th, 2017. The CMHC indicated that the average CMHC-insured homebuyer will see an increase of about $5 per month. Both Genworth Canada and Canada Guaranty (the other two mortgage loan insurance providers) are matching the CMHC's increases. How much is mortgage loan insurance? It's easy to underestimate how much these premiums are when looking at it from a month-to-month perspective. But the fact is, mortgage loan insurance is expensive, which is why saving as much as you can for a down payment is a smart money decision. The bigger your down payment, the less you'll have to pay in mortgage loan insurance premiums which can save you thousands of dollars. According to the Canadian Real Estate Association, the average price of a home in Canada was $470,253 this past January. Using this as our sale price, the following is how much mortgage loan insurance will cost before, and after, March 17, 2017 with the following down payments. As shown above, instead of putting down five per cent on your home, you can save over $4,000 by putting down 10 per cent, and over $6,000 by putting down 15 per cent. How to get mortgage loan insurance? 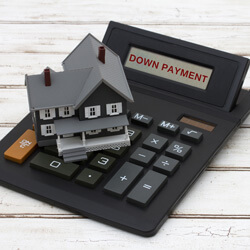 If your down payment is less than 20 per cent, your lender will get the insurance on your behalf. You'll then typically be given the option to pay the premium in one lump sum, or add the cost to your mortgage loan. If you add your premiums to your mortgage loan, you'll end up paying interest on your premiums at the same rate you're paying for your mortgage—in essence, increasing the cost of the insurance even further. While it may not be feasible for everyone, paying for your mortgage loan insurance in one lump sum will likely save you several thousand dollars in the end. When it comes to mortgages, every percent counts. Compare mortgage rates from 30+ financial partners at Kanetix.ca, and easily connect with the lender for your best rate.